What happens when you combine an expensively average roster with two budding stars and an outstanding goalkeeper? You get a midtable team that lurks around — but never particularly challenges for — the Champions League places. In other words, you get Tottenham Hotspur. But don’t despair, Spurs fans. In the shape of 21-year-old Harry Kane and 22-year-old Christian Eriksen, there’s reason to hope. Just how much and how soon, you ask? That requires a bit of a deeper look. 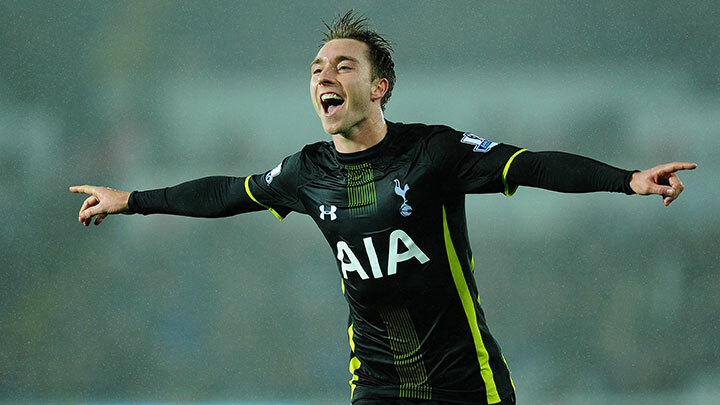 Eriksen’s goal put Spurs up 2-1, saving them from an embarrassing and costly draw with Sunderland. If that sequence seems familiar, it’s because Eriksen has done this before. Of his eight goals this season, four have come at the 70-minute mark or later and won his team the game. As for Kane, while the clamor for his inclusion began much earlier, the Spurs youth academy prospect didn’t start his first league game this season until November 9 against Stoke. By that time, he’d already scored a game winner against Aston Villa, five goals in the group stages of the Europa League, and a pair in the League Cup. Kane didn’t wait for a door to open; he ripped down the entire frame and wore it as a necklace. His aggregate numbers are a bit limited because of the late start, but he’s scored 0.57 goals per 90 minutes, which is fifth in the Premier League.1 Although he announced his presence to the wider world with two goals, one assist, and a drawn penalty against Chelsea on New Year’s Day, Kane’s transformation into a fire-breathing, goal-scoring monster wasn’t some sudden holiday surprise. Getting late goals to win games is awesome, but it’s not a sound strategy for success. Eventually Eriksen will stop sniping corners in the dying minutes with such regularity, and Spurs will start dropping points they haven’t. Not to mention, both Eriksen and Kane are slightly overperforming their Expected Goals totals.2 So while the two of them are really, really good — and may ultimately become great — banking on them to keep bailing the team out is asking for trouble. On the other side of the ball, Spurs are legitimately bad. Only Swansea have conceded more ExpG per game, and that Spurs have only conceded 30 goals, as opposed to the 37 predicted, is a minor, Hugo Lloris–shaped miracle. The French keeper has faced the third-most shots on goal in the league, but the guys ahead of him — relegation fighters Robert Green of Queens Park Rangers and Tom Heaton of Burnley — get pelted with an avalanche of on- and off-target shots on a weekly basis. That’s not the case with Spurs, as they concede an average number of total shots,4 but 35.7 percent of those have been on target, the highest number in the league. That’s because, on average, teams are shooting from only 17.2 yards away, which is also the worst figure in the league. And as you might imagine, with teams shooting from closer range, Spurs don’t block many shots either, only stopping 24.5 percent, fourth-lowest in the league. Instead, they’ve been relying on Lloris doing this all season long. Unfortunately, as Tim Howard recently learned, hot goalies can’t stay hot forever. Where to place the blame for Tottenham’s atrocious defense is, as always, a tricky proposition. The central midfield seems like a good place to start, though, as Spurs have rotated through Paulinho, Mousa Dembélé, Benjamin Stambouli, Etienne Capoue, Ryan Mason, and Nabil Bentaleb in those roles. With the possible exception of the 20-year-old Bentaleb, who is currently away at the African Cup of Nations with Algeria, those options offer more questions than answers. Given how energetically manager Mauricio Pochettino wants his midfield to press, this area of the field is in desperate need of an upgrade. The situation at the back is less clear. With Kyle Walker working his way to health and Federico Fazio finally settling into his central role, it appears that Spurs have a back four they’re confident in. Now that the likes of Younes Kaboul and Kyle Naughton have been glued to the bench and center backs Eric Dier and Vlad Chiriches aren’t being stranded on the right, maybe that confidence will start to pay dividends. If not, well, it probably means another heavy overhaul in the summer. There are only so many superstars in the world, and they all have high price tags that teams already in the Champions League are willing to pay. So having two guys in Kane and Eriksen with that potential is a good start. Building a high-caliber supporting cast around them is the easier part. Despite what the current roster might suggest, Spurs have pretty much had their pick of good-but-not-great players in recent years. It’s a (generously) open question as to whether they’ve actually made the right personnel choices — and some, like Roberto Soldado, certainly appear to have been giant misfires — but the point is that these guys are accessible. When this season started, Spurs were a team that wasn’t quite good enough, but they were also a team without any obvious way to get better. With the emergence of Kane and Eriksen, that’s no longer true. The club may be struggling, but that’s a cheap price to pay in order to unearth a couple of true talents. If Kane and Eriksen do make the leap to world-beater status, the next step would be to build intelligently and quickly around that pair. If the Luka Modric and Gareth Bale era left any legacy at Spurs, it should be that the window always opens and closes quicker than you expect. The super clubs will come calling sooner rather than later — and the whole process begins anew. Stats, as always, courtesy of ESPN Stats & Info. Kane is 10th in the league with 0.42 ExpG per 90, and Eriksen is down at 25th with 0.25, which is below teammate Nacer Chadli, who’s 22nd with 0.28. One bright spot is that they aren’t actually scoring more goals than you’d expect, as ExpG has them at 30.62 to the 32 they’ve scored. Dead average, actually. They’re 10th in the league with 286 shots conceded.